I’m baaaack! Well, I’ve been back for like ten days but post-vacation blues and subsequent post-vacation illness had me in not so much of a bloggy place. I still feel like I have about five thousand errands to catch up on but I’m slowly getting back into the swing of things. Having a nice long weekend next week will definitely help in this capacity, but I’ve got five long days at both jobs ahead of me before that. Having one of these tonight will help me soldier on. While in Florida I looked for different cocktails that I’d like to re-create at home, this was one of the first to catch my eye because bourbon, of course. 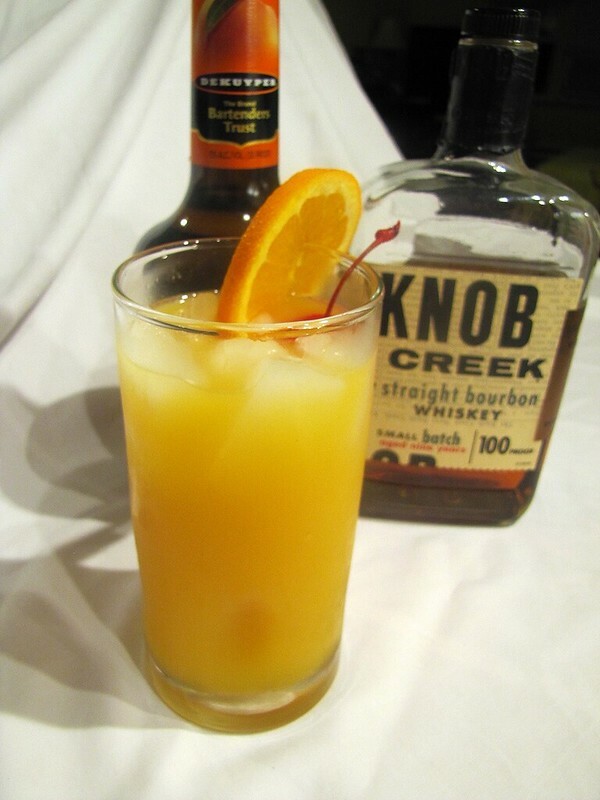 The menu listed a different bourbon used in their version, thus calling it a “Peachy Buffalo” or some such; since I have/prefer Knob Creek Bourbon I’m calling this one the Up Peach Creek. I haven’t used/drank peach schnapps in ages but the first whiff when I opened the bottle brought me back to the summers of the late 80’s and early 90’s when my parents would have picnics and my mother and all her friends would be drinking fuzzy navels and possibly sneaking sips to me, I’ll never tell. PeachTree is definitely not something I’d use every day but I do like the sweetness it imparts here. It cuts the burn of the bourbon just enough to make this one chuggable (and therefore slightly dangerous) cocktail. Fill a large glass with ice. Add bourbon, schnapps, syrup, juice, and stir. Garnish with cherry and orange slice, if desired, and serve. Next week: Maybe a post about the trip, definitely a recipe post, and OMG YAY HARVEST FEST. See you then. Have a great weekend. Cheers! mmmm so pretty! love peach and orange together.